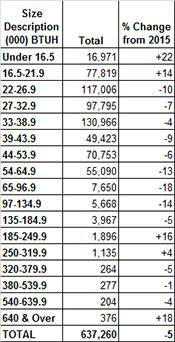 U.S. shipments of residential gas storage water heaters for April 2016 shifted slightly to 366,436 units from 366,540 units shipped in April 2015, an overall 0.0 percent change. 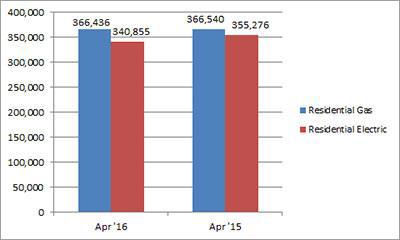 Residential electric storage water heater shipments decreased 4.1 percent in April 2016 to 340,855 units, down from 355,276 units shipped in April 2015. For the year-to-date, U.S. shipments of residential gas storage water heaters decreased 11.9 percent to 1,450,197, compared to 1,645,515 units shipped during the same period in 2015. 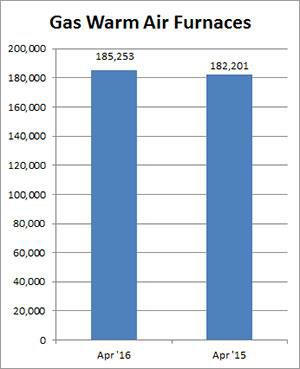 Residential electric storage water heater shipments decreased 18.6 percent year-to-date to 1,339,227 units, compared to 1,645,331 units shipped during the same period in 2015. 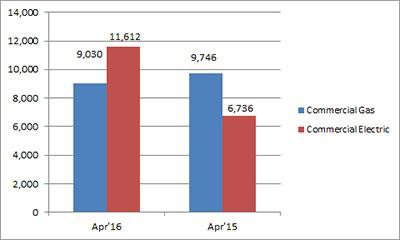 Commercial gas storage water heater shipments decreased 7.3 percent in April 2016 to 9,030 units, down from 9,746 units shipped in April 2015. Commercial electric storage water heater shipments increased 72.4 percent in April 2016 to 11,612 units, up from 6,736 units shipped in April 2015. Year-to-date U.S. shipments of commercial gas storage water heaters decreased 8.3 percent to 34,451 units, compared with 37,566 units shipped during the same period in 2015. Year-to-date commercial electric storage water heater shipments increased 40.3 percent to 39,918 units, up from 28,461 units shipped during the same period in 2015. U.S. shipments of gas warm air furnaces for April 2016 increased 1.7 percent to 185,253 units, up from 182,201 units shipped in April 2015. 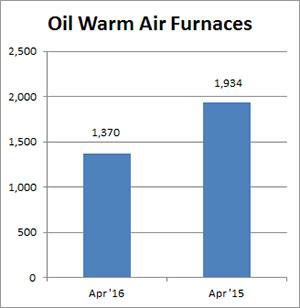 Oil warm air furnace shipments decreased 29.2 percent to 1,370 units in April 2016, down from 1,934 units shipped in April 2015. Year-to-date U.S. shipments of gas warm air furnaces increased 2.8 percent to 802,243 units, compared with 780,688 units shipped during the same period in 2015. Year-to-date U.S. shipments of oil warm air furnaces decreased 10.0 percent to 9,456, compared with 10,508 units shipped during the same period in 2015. U.S. shipments of central air conditioners and air-source heat pumps totaled 637,260 units in April 2016, down 5.4 percent from 673,360 units shipped in April 2015. 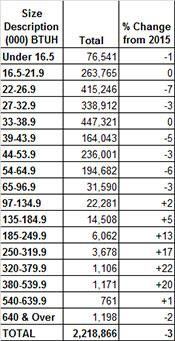 U.S. shipments of air conditioners decreased 3.2 percent to 441,461 units, down from 456,072 units shipped in April 2015. U.S. shipments of air-source heat pumps decreased 9.9 percent to 195,799 units, down from 217,288 units shipped in April 2015. 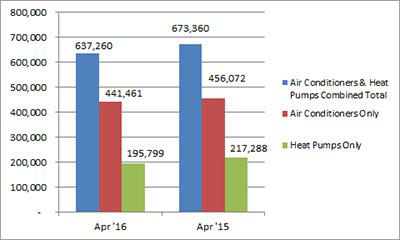 Year-to-date combined shipments of central air conditioners and air-source heat pumps decreased 3.7 percent to 2,218,866 units, down from 2,304,783 units shipped in April 2015. Year-to-date shipments of central air conditioners decreased 2.4 percent to 1,442,124 units, down from 1,477,251 units shipped during the same period in 2015. The year-to-date total for heat pump shipments decreased 6.1 percent to 776,742 units, down from 827,532 units shipped during the same period in 2015.